According to an Irish tale, an old man named Jack was scurrying home along a country road when the devil sud­denly appeared beside him. 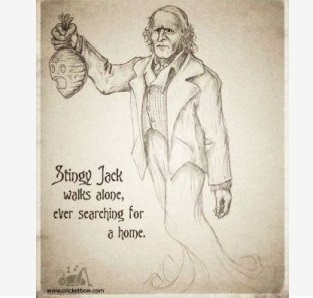 Jack knew the devil had come to claim his soul, for he had been a stingy, mean, and selfish man. As the two walked along, they came to a tree heavy with big, red apples. «Wouldn’t an apple taste good right now?» Jack sug­gested to the devil. So the devil climbed up onto Jack’s shoulders, swung himself onto a branch of the tree, and began picking the biggest, the reddest fruit he could find. Suddenly, Jack whipped out his pocket knife and carved the sign of the cross on the tree trunk. That made it impossible lor the devil to climb down out of the tree. But Jack was far too smart to fall for that. «I’ll let you down only if you promise NEVER to claim my soul,» he said. And the devil, desperate to get down, agreed. «But where then shall I go?» Jack asked. «Back from where you came,» the devil replied. «I’ll never find my way back to earth in the dark,» Jack cried. So the devil threw him a chunk of coal from the very furnaces of hell. Jack caught the glowing ember and placed it inside a turnip he was gnawing on. He has been wander­ing around the earth with this first jack-o’-lantern in search of a resting place ever since! В одной старой ирландской легенде говорится, что однажды старик Джек торопился домой по проселочной дороге, как вдруг дьявол преградил ему путь. Джек был скрягой, ничего хорошего людям в жизни не делал, только о себе всегда думал. Увидев дьявола, он понял, что тот пришел за его душой. Пошли они вместе. Вскоре они подошли к яблоне, которая была усыпана большими спелыми яблоками. Джек захотел задобрить дьявола и спросил, не хочет ли он попробовать сочных красных яблок. Дьявол сказал, что не против, но яблоки висят очень высоко и ему их не достать. «Ну, тогда встань ко мне на плечи и достанешь», -предложил Джек.